Arrive in Sao Paulo - Fly to Cuiaba - Drive through Transpantaneira into the Pantanal. Ubatuba to Sao Paulo, where the tour ends. Superb birding in four top destinations: Pantanal - Chapada dos Guimaraes - Itatiaia - Ubatuba. Expect: 400-450 species, good accommodation, easy to moderate terrain, some long drives, warm to hot climate. Departures anytime from June to October. The Pantanal of Mato Grosso is the world’s largest freshwater wetland, located at the heart of South America, and home to the greatest concentration of wildlife in the continent. This trip, in combination with the contrastingly different savannas and escarpments of Chapada dos Guimarães National Park, maximises the birding potential of these areas. The Pantanal is famous worldwide for its population of the impressive Hyacinth Macaw and the huge numbers of the massive Jabiru. During the five days that we will spend in the Pantanal we will be birding on foot, from the vehicle, and by boat. A number of trails give access to the woodland interior and gallery forests. Here the specialities include the striking Helmeted Manakin, Mato Grosso Antbird, White-lored Spinetail and Ashy-headed Greenlet. 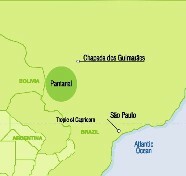 The Pantanal is dissected by the Transpantaneira highway, a dirt road that runs along an elevated embankment. It gives the best opportunities to spot much of the wildlife of the area, especially the mammals. Marsh Deer, Tapir, Coatis, Racoons, Crab-eating Fox, Collared Anteater and cats such as Ocelot and even Jaguar are all likely to be spotted from a vehicle along the Transpantaneira, during a night excursion. A boat ride along the Pixaim River is the best way to find the more secretive species, such as Sungreebe, Sunbittern, Agami Heron and Bare-faced Curassow. We will continue our trip in Chapada dos Guimarães. The habitat here is strikingly different. The national park is located by the very edge of the plateau of the central Brazilian Planalto. Up on top we will bird the Cerrado savannas that hold many endemic birds and specialities. Among these are White-rumped and White-banded Tanagers, Coal-crested Finch, Rufous-winged Antwren, the recently described Chapada Flycatcher, Blue Finch and many others. The highlight here is probably the breathtaking scenery of the edge of the plateau, the waterfalls and the outstanding rock formations, all in deep red hard sandstone that glows in the afternoon sun. It is at sunset that these cliffs come to life, as hundreds of parrots and swifts arrive to spend the night. Biscutate and Sooty Swifts come together with Blue-headed Parrot, White-eyed Parakeet, and the beautiful Blue-winged and Red-and-green Macaws come in an amazing sight. The last part of the trip is in the Atlantic Forest of South-Eastern Brazil. We will visit the famed Itatiaia National Park and, by the Ocean, the lowland tropical forest near Ubatuba. Here you readily find rarities such as Black-capped Piprites, Itatiaia Spinetail, Black-and-gold Cotinga and Thick-billed Saltator, as well as Giant Antshrike, Swallow-tailed Cotinga and Largetailed Antshrike. The lowlands, having suffered more from human activities, still hold forest tracts with Buff-throated Purpletuft, Eyeringed and Fork-tailed Tody-Tyrant, Pale-browed Treehunter, and the delicate Scaled Antbird. Throughout the forest areas we will also look for White-breasted Tapaculo, Serra do Mar Tyrant-Manakin, Orange-eyed Thornbird, Spot-breasted Antvireo and Tawny-browed Owl.